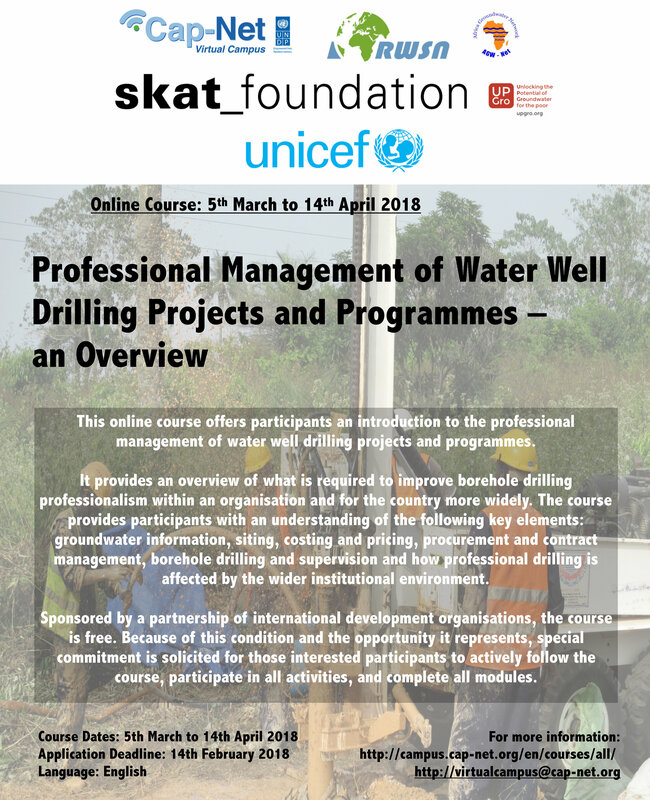 We would like to announce to you that the registration is now open for an online course: Professional Management of Water Well Drilling Projects and Programmes – an Overview that will run from the 5 March to 14 April. The course provides an overview of what is required to improve borehole drilling professionalism within an organisation and for the country more widely. The course provides participants with an understanding of the following key elements: groundwater information, siting, costing and pricing, procurement and contract management, borehole drilling and supervision and how professional drilling is affected by the wider institutional environment. Click here for more information. The course builds up to a final assignment whereby participants are tasked with exploring actions that could be taken within their own organisations, local authority and/or country to improve borehole drilling professionalism. Certificates will be awarded to those that successfully complete the course. The course is open to a maximum of 80 participants from Government, the Private Sector, NGOs, UN-Agencies, Academia and Donor Agencies. To apply for a place, register here by the 14th February. The course is designed for both those with a technical (i.e. engineering/science) and those with a non-technical (i.e. social science/economics/arts/politics) background. Participants should have a diploma or bachelor’s degree qualifications and at preferably at least three years of work experience in water supply service delivery (social or technical aspects), civil engineering, rural development or water/environmental management. As this is an introductory course, participants are not expected to have a detailed understanding of hydrogeology. The course language is English. The six week course (5 March to 14 April) is hosted on the UNDP Cap-Net Virtual Campus. It will be facilitated by Skat Foundation, UNICEF, RWSN, AGW-Net and UPGro together with sector experts.